The containment of pollution by physical defenses is the first step in restoring the ocean to its natural state. 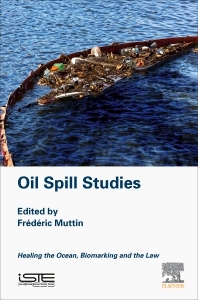 The first two chapters of Oil Spill Studies: Healing the Ocean, Biomarking and the Law describes the feedback on seven experiments made on the East Atlantic Ocean. The first chapter concerns semi-open sites while the second focuses on open environment directly linked to the ocean. The third chapter examines pollution from a French harbor marina and its effects on the local biodiversity. The book provides a methodology to quantify biological contamination coming from heavy metal releases into the environment. Chapter four provides the state-of-the-art in the science of a mid-depth-living fish species affected by the treatment of oil pollution by chemical dispersion. In a similar way, the fifth chapter addresses new explored and exploited ocean with extreme environments such as the Arctic and deep sea. The sixth and final chapter provides a lawyer’s analysis on the subject. Frédéric Muttin received his Ph.D. in Applied Mathematics in 1989 from Nice-Sophia Antipolis University. He earned his HDR Habilitation in Industrial Mathematics at the University of Limoges, 2010. His research activity started in 1985 for La Rochelle sailing industry. Since 1993, he is a Professor at the Engineering School EIGSI La Rochelle Casablanca. Currently his research concerns numerical methods and statistical analyses applied to marine pollution and coastal environment. He studies accidental and chronic water pollutions and conducts full-scale experiments about interactions between flexible structure and floating fluid on the sea surface.